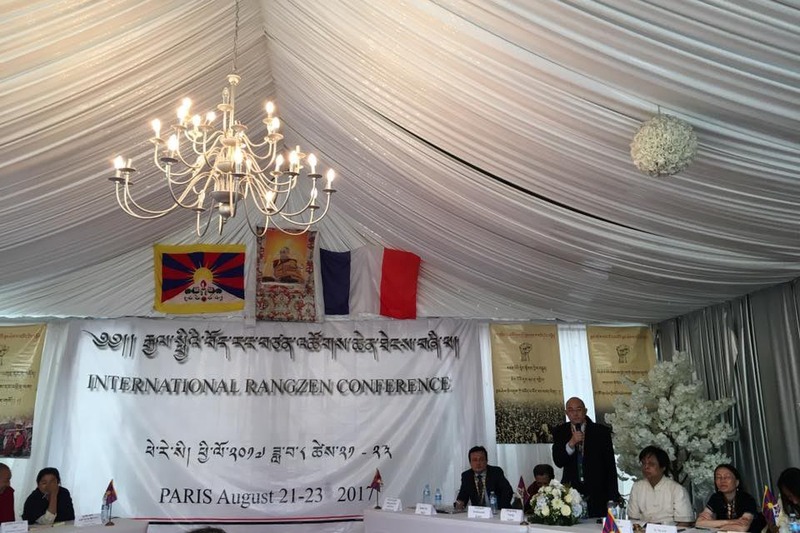 The three-day International Rangzen Conference began today in Paris with a one-minute silence for the Tibetan martyrs who sacrificed their lives for the independence of Tibet. Present on this first day were the members of Tibetan parliament in exile, Lhagyari Namgyal Dolkar, Monlam Tharchin, Tenpa Yarphel, and Juchen Konchok. Welcoming the participants and various guests, Gyaltsen Pontsang, President of the organising committee, expressed appreciation for the overwhelming support, messages, and financial support for this 4th edition of the International Rangzen Conference. Chief Guest Lhagyari Namgyal Dolkar said that one must always remember that the heart of our struggle is fighting for independence. “I am very grateful for the courage and the sacrifice of Tibetans inside Tibet, who despite the danger continue to fight for Tibet,” she reiterated. Former political prisoner Atsok Lukar Jam spoke about the need for Tibetans to be ready to grasp opportunities that will surely present themselves due to the changing global alliances at present. Uyghur leader Dolkun Isa spoke on the “Future for East Turkistan and the struggle for independence” and the need to build stronger alliances amongst “people fighting against the Communist China’s rule”. Referring to his recent detention by the Italian police a few moments before he was slated to speak, Dolkun Isa said that “For the first time, I didn’t feel safe in Europe”, even though he has a German Passport and the fact that he was in an European country. Dr Xu Pei also underlined the growing Chinese efforts to undermine democracy all over the world. “Revival of a nation is not just about religion and culture, and we need to continue to work from one generation to the next to regain our independence,” said the Bon representative to the Tibetan Parliament-in-exile. “The loss of this profound and millennial-old Tibetan culture is a great loss to the culture of non-violence and peace in the world, which will have an impact on our world,” said Tenpa Yarphel. Former MP and Tibetan activist based in Switzerland, Tethong Wangpo, talked on the impact of “Migrational policy of China”. He stressed the need to revisit and work to confront this policy of China that will demographically have an irreversible effect on the Tibetan issue. “Notwithstanding whether you support the ‘Middle Way’ or ‘Rangzen’, this is an issue on which we can all work together”, opined the former MP. “It is absolutely imperative that we do not dilute the message and the intention of the self-immolators and try to fit them into an invented narrative,” warned Choenyi Woeser. She stressed the need for Tibetans, especially activists, to preserve the “Tibetan language and the culture as the survival of the Tibetan as a people depend on it”. “Rangzen conferences like this are individual initiatives, and this is not an effort to oppose His Holiness the Dalai Lama but revival of Tibetan independence,” she concluded. The day closed with a cultural presentation and gorshey at the end. Day two will have speakers from Inner Mongolia, Taiwan, and overseas Chinese democracy activists.